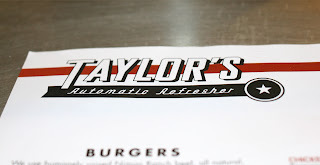 Taylor's Automatic Refresher: San Francisco Hamburger. the famous burger all wrapped up and served on a metal tray. A shot of the egg bun and slightly pink meat. 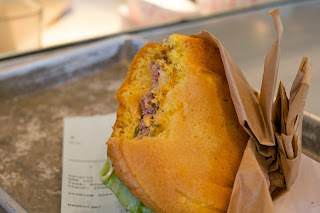 This is the classic American Burger at San Francisco's Ferry Market. It was pretty good, but is this a burger that's more hype than substance? It's pricey at $6.99 for the regular hamburger. This price doesn't include fries, drink, or tax. The meat isn't thick, but it is juicy and with a distinct beef flavor. It should because they raise their own cows. 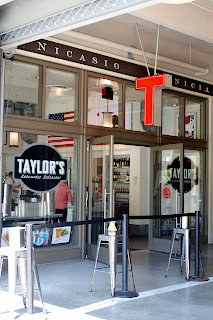 This is the main selling point for Taylor's. They raise the cows on vegetarian feed (so the burger is sans mad cow) and the cows don't receive antibiotics or growth hormones. 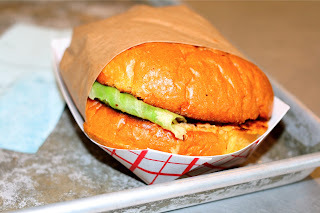 The egg bun is thick and does a good job of sopping up the flavorful juices. I think it was a little too thick and took away from the meat. I agree with limited amount of toppings on the burger. Taylor's hamburgers only have lettuce, pickle, and "secret sauce." Now the secret sauce is clearly "Thousand Island Dressing." Now, do you think McDonald's used the Taylor's burger as inspiration for their Big Mac? Overall, not a bad burger but not a burger I would rave over. I heard the sweet potato fries and the garlic fries are amazing, so should I go to a burger joint and order fries? I guess I could pretend to be vegetarian.